I sure enjoyed this Christmas Season. Family visits, exquisite meals mixed with friendly family board games and jigsaw puzzles, plus a good movie. I hope all of you enjoyed it as well. Got this email from Bob Lightsey: "Recently I was teaching an engineering management class at Ft. Monmouth, New Jersey. I had the students introduce themselves and tell about their backgrounds. One of the young guys in the class introduced himself as John Bellino, a Navy employee, and he mentioned that his father had won the Heisman Trophy "a long time ago." Turns out that this was the son of Joe Bellino, who, I recall, spent an afternoon sprinting up and down the field while Navy beat us like a drum; I think we had traveled to Philadelphia to see the game. He says Joe Bellino is now retired and lives in Boston. He played pro ball for the team that became the New England Patriots for a while before his knees gave out. I thought it was interesting to get this flash from the past." Bob, that was interesting. I remember that afternoon well. Wish I could forget it. Here’s a quick note from Ron Taylor: ‘Hey Jack, Good news and sad news. The good news for us is that my wife, Bobbie, passed her oral boards and will be ordained this June. The sad news is that the other three nominees at the boards did not pass. It is sort of like winning the MVP and having your team lose the game. This June will be seven years since she started by applying for seminary. Ron Taylor " Thanks for the update and for contributing to the column. Got an email from Bob Gibson with a picture and write-up. Since 1972,Northrop Grumman has sponsored a Marine Corps Aviation Association. (MCAA) Aviation Command and Control Officer of the Year award that is bestowed upon the individual selected for their outstanding contribution to Marine aviation command and control. In 1995, this award was renamed in honor of Colonel Robert F. Gibson, who "pioneered the concept of integrated air control group detachments supporting Marine aviation around the globe. 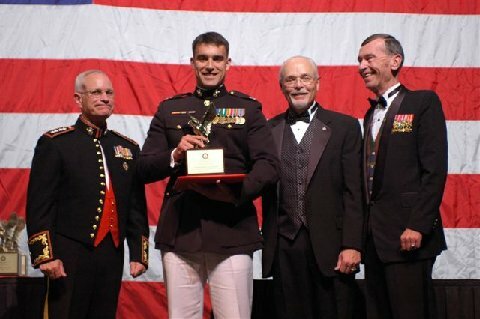 In the accompanying photo, Captain Kenneth Karcher, second from left, received the 2005 Robert F. Gibson Award for immeasurable contributions in support of the global war on terrorism. Pictured with Captain Karcher are (from left): General Robert Magnus, Assistant Commandant, USMC, Bill Bowling, ES Manager, USMC Business, and retired Colonel Robert Gibson, USMC, for whom the award is named. Congrats to you Bob for being honored that way. Swonson’s Retirement. Never thought he would beat me to retirement. Here’s what he says: "Well, I turn 65 on 1/20 and USAA requires Sr. VPs and above to retire at that age. So I will work my last day on 2/28, completing exactly 18 years with USAA. I'm looking forward to it; it's time to do something different. I haven't figured out just yet what that will be, but I know I can't just play golf. Polly Ann and I will move into a new home in April in Desert Mountain, a large gated community in the far north end of Scottsdale. It has six 18-hole Jack Nicklaus courses. It's up against the mountains so it's typically about 8-10 degrees cooler than Phoenix/Sky Harbor airport. We'll have nice guest quarters at the new house and Red Tags are always welcome. Come see us! Jack " That’s a nice way to retire. Hope I have a chance to stop by someday. A short word from the Landers. "We are back in Texas (thank heavens). Enjoying retirement. Again. Paul & Joanne." Thanks, Paul. Got a card, pictures and newsletter from Stan & Mary Anne Patrie. They traveled a lot this year, to Mary Anne’s 8th grade 50th reunion and then Stan’s Mom’s 90th birthday.. Also got a newsletter from Owen & Connie Hawkins who also traveled a lot but had to take time out for shoulder surgery, both of them. Randy & Lieu Schamberger missed a slug from the hurricanes this year and took time for a trip to Europe. Charlie & Pat Hale had good year. He’s still working and she loves the quilting. Report from Judy Dinsmore that John has not moved his seven tractors (Collectors items) at all this year. Dan Donovan is a Training Manager for Ameritrade. Daughter, Kelly, finished grad school and subsequently married a Zoomie from ’97. Now this from Sam Dehne. Last year my Too Wild Yankees Band singing partner Tommy Clark and I were the commentators for 3 different televised amateur fight cards that had lots of USAFA vs Nevada bouts. One of the videos of the USAFA cards is on sale on the internet (contact Sam for details). 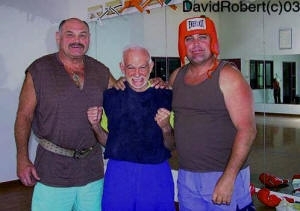 Here is a picture of Tommy Clark (on left) and me... and my other sparring partner David Foster. IT'S THE TRUTH. They tell everyone they enjoy boxing with me... except when I "muscle them around". The Haugens had lots of trips to see grand children. I think Sue is still speaking to me even though I distorted her name two issues ago. TK & Virginia Moore went to Angkor Wat and TK posed in front of a temple. I couldn’t tell which object was the stone monk. Just kidding. Willie & Nancy Gray advised that they are fed up with hurricanes and are moving north of Atlanta. Since their son lives in Atlanta, that probably had an influence. Jon & Carolyn Staples are enjoying their Colorado Springs home. Jon had an operation and is walking much better. Charlie & Mary Jo Price are enjoying retired life in Valdosta. They celebrated their 40th anniversary this year. Art & Sandy Farrington now have 11 grandchildren with another on the way. 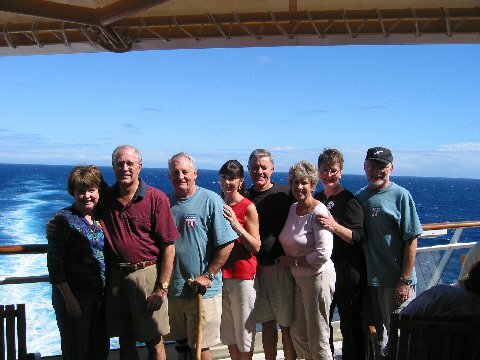 Kirk & Rosemary Vaughan finished their five years in Oman and are back in Beavercreek, Ohio. Kirk teaches part time at AFIT and Rosemary works for a base contractor. Well, I used my 1200 words. Keep the emails and letters coming. You all did a good job supporting me this issue. Cheers, and Go Redtags!